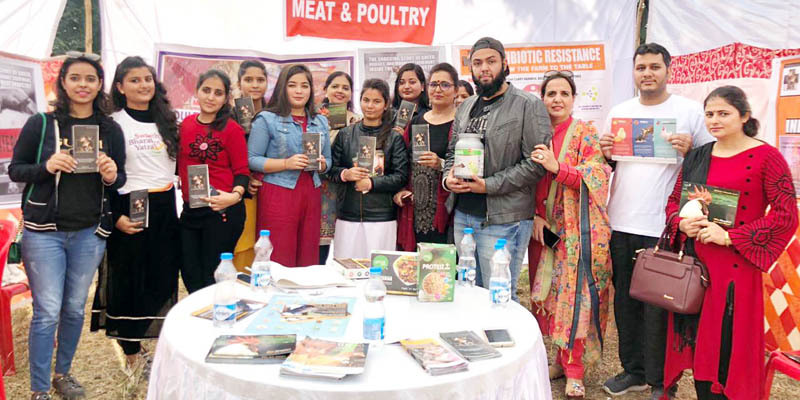 JAMMU, Nov 30: An awareness programme on common adulterants and contaminants present in milk, meat, fruits and vegetables was today held at Women College Gandhi Nagar. The programme was jointly organized by Save Animals Value Environment and Rotary Club Elite. Students and other invitees were given a comprehensive picture of the greed infested today’s industry and how the consumer needs to know the common adulterants, it’s bad effects on health and how to make aware choices. Speakers in the programme informed that milk is commonly adulterated with formalin, caustic soda, urea, detergent, neutralizers, water, hydrogen peroxide, sugar etc to increase its quantity, thickness and shelf life. “Pesticides, oxytocin and antibiotics are also laden in milk,” they said adding, that it is very harmful for the consumer as such milk causes diabetes, acne, Alzheimer, early puberty, asthma, cancer, obesity, cataract and lactose intolerance. The experts said that meat, fish and poultry is also infected and contaminated with e-coli, salmonella, formalin, ammonia , hormones, antibiotics, dermatitis, synthetic yolk, high mercury levels in fish and many other chemicals are added to the meat and chicken to increase its shelf life, reduce odor , maintain texture and retard bacteria growth. All these things too causes cancer, hormonal imbalance, heart disease, liver malfunction ammonia and mercury poisoning and antibiotic resistance to a alarming extent. Some healthy substitutes of milk which were plant based and easily available and digestible were suggested to the students and teachers. The speakers said that vegetables, nuts, cereals, soya etc are a store house of protein which is more easily digested and is eco friendly. They advised that instead of purchasing oversized fruits and veggies one should prefer small uneven produce as it is more natural and has less chances of being modified or manipulated. Hemlata Karki, Malvika Kalra, Gurvinder Kaur, Rumpy Madaan, Vishal Khajuria and others were also present.